Popular iOS comic book app comiXology on Thursday sent out emails to existing customers, notifying them of a new DRM-free backup download service for content from certain publishers. ComiXology has been one of the top grossing iPad apps for years. According to the message from comiXology, select comics from Image, IDW Publishing, Dynamite Entertainment, Zenescope Entertainment, MonkeyBrain Comics, Thrillbent and Top Shelf Productions are now available to download without digital rights management restrictions. In addition, comiXology Submit artists can opt-in to the service if they so choose. The list of publications supporting the feature is expected to grow, with "many more" said to be jumping on the DRM-free bandwagon in the future. As noted on the comiXology's frequently asked questions webpage for the new program, also launched on Thursday, customers who have already purchased digital copies of now DRM-free books can download a copy as a PDF or CBZ file. Users will see a list of books that support DRM-free backup on comiXology.com in the My Backups tab of the My Books area. An obvious drawback to the download service is that both PDF and CBZ files cannot be used in comiXology's Comics app, meaning the company's proprietary "Guided View" reader tech is also unavailable. 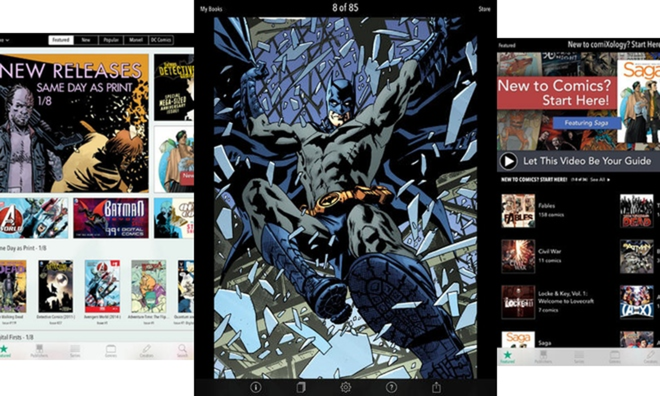 Shortly after being acquired by Amazon in April, comiXology pushed out a new version of its iOS app, stripping it of in-app purchasing capabilities. The apparent play to skirt Apple's App Store fees forced users to buy comics through the company's Web portal, a method used by Amazon in its Kindle app. Apple normally takes a 30-percent cut of all app sales, including in-app purchases.